On April 24th, Katherine and I saw our first butterfly of the season. I forgot to blog it, as other things leapt into my path and track-sided me, but I’m writing it now. 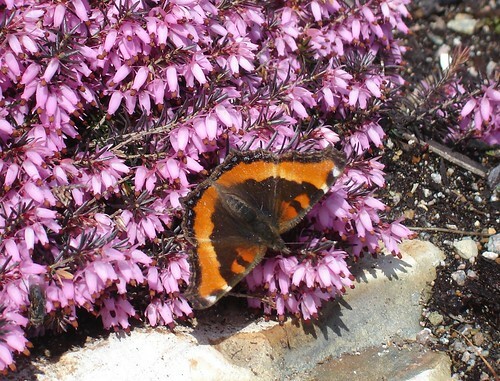 Coincidentally, we saw our first butterfly last year on April 24th as well; the same sort on the same heather plant. I didn’t get a picture of this years insect, so last year’s will have to do. 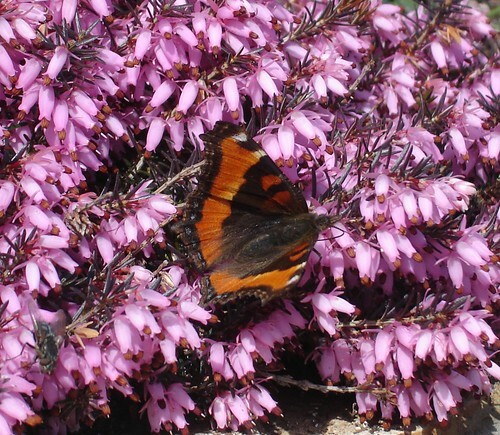 A butterfly dances on spring-blooming heather (erica carnea). Apparently a Milbert’s Toroiseshell. Thanks to Sarai for identifying it! Lucky you! I have not seen any butterflies yet this year. Perhaps I ought to spend more time with flowers.